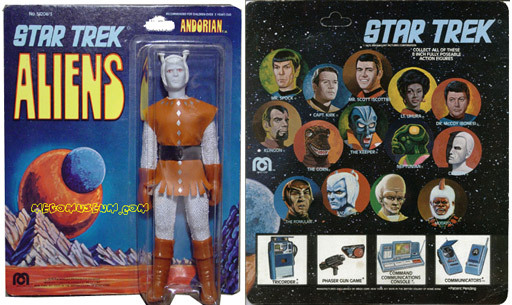 The Mego Andorian (Item No. 51204/3). If the Romulan figure can claim bragging rights for holding the title of Best Overall Mego Alien, then the Andorian can at least claim the prize of Most Accurate Mego Alien, just nosing out the Romulan. Based obviously on the lone Classic “Trek” appearance of an Andorian in the episode “Journey to Babel,” this figure is faithfully modeled and beautifully executed. Though obviously not perfect, it’s certainly several magnitudes of accuracy greater than the average fare that the seasoned Mego collector has come to expect from the toymaker. The head sculpt is nothing short of sublime. The face features an expression that betrays the utter contempt that this warrior race feels toward all other cultures, and their innate sense of smug superiority. A beautiful set of antennae adorn the head, necessitating the use of the deeper/taller bubble for the Mego Andorian’s packaging. 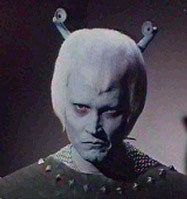 The Type 2 body is cast in powder-blue (a body shared with another “Trek” Alien: the Keeper). The figure is clothed in a white/silver bodysuit (reminiscent of the chain mail fabric used for Mego’s Knights) with a brown vinyl doublet–detailed in silver diamonds–protecting the torso. The outfit is accessorized with a pair of brown boots, a pair of side-specific brown gloves, and a wide black plastic belt with a diamond molded in the center. The Mego Romulan gets all the attention, partly due to the enemy race’s popularity and partly due to the quality exhibited in the figure’s execution. Andorians may not be as popular as Romulans, but they sure do strike an imposing figure with their ornate outfit and canonical accuracy. 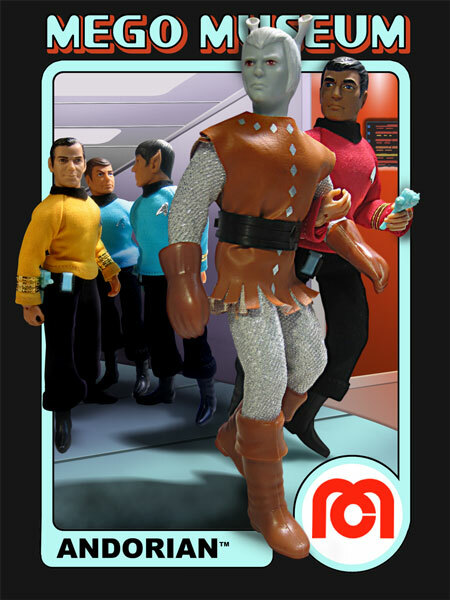 Consider the following as a measure of the greatness of this figure: there is no shortage of Mego customizers in the community that have tried their hand at building a better Klingon, Gorn, Talosian, Mugato, Cheron, or even a Romulan. However, custom Andorians are rarely if ever attempted. The implied attitude is this: What’s the point in trying to improve on something that was done right the first time? 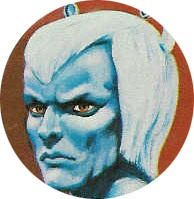 Andorian’s belt is unique to the character and has been factory reproduced by Doctor Mego. Quite well actually, so well that it’s pretty impossible to tell the difference. A mistake at the factory during production kept these reproductions from being marked with the usual DM, so there are no indicators to identify the reproduction. The reproduction looks shiney and new, very glossy. A loose Andorian’s belt usually has some wear. Of course if the figure just came off a card, or has been kept mint and the original belt still looks new, then good luck. Andorian gloves are unique to the character and no factory made reproductions are available. Andorian style boots have been factory reproduced by both Doctor Mego and Classic TV Toys, although neither quite reproduced the odd color of the original Andorian boots. 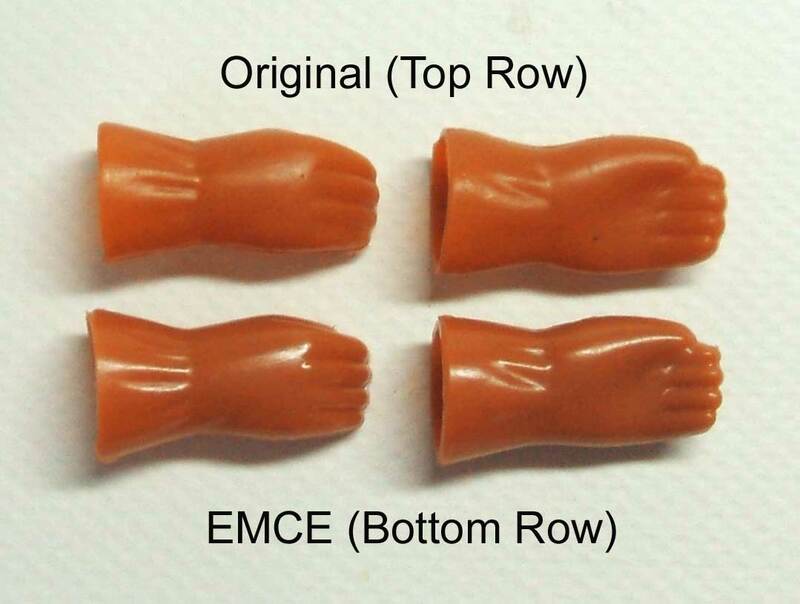 The original boots are a kind of orangish brown, while both sets of reproductions are simply brown. Other than color, DM’s are very close in texture, although the plastic is a touch thicker. 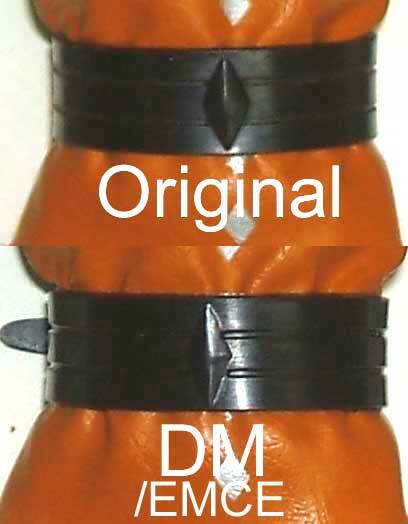 They are marked DM on the bottom. CTVT’s are close in thickness, but have a rough texture to them. They are marked CTV on the side. Andorian’s vest is unique to the character and has not been factory reproduced. Andorian’s suit is unique to the character, but very similar to the jumpsuits worn by the Knights line. Both have a silver chainmail look, the main difference being that Andorian’s suit chainmail is sewn into a white material, while the knights are sewn into a gray material. This makes the knight suits darker in appearance. 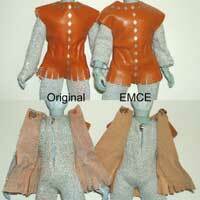 Both Doc Mego and CTVT have made factory produced suits similar to Andorian’s. Doc Mego’s is based on white material, but is VERY transparent. The body is quite visible under the suit. There is a tag sewn into the suit with the DM marker. 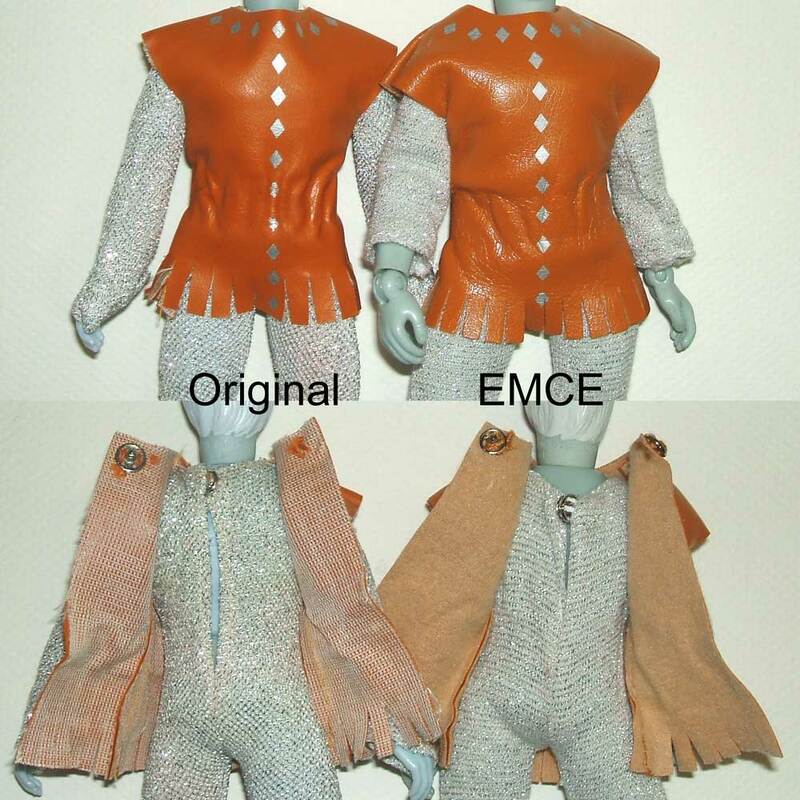 The CTVT reproduction is actually a reproduction of the gray based knights jumpsuit. While there is the color difference, it is about the closest looking reproduction suit available for Andorian. The CTVT suit is unmarked.